Botvac D5 Connected vs D7 Connected - Is the D7 worth the Extra $200? Neato Robotics released the D7 Connected just the other day, and it costs $300 more than the predecessor the D5 Connected. This would complicate the matter if you had already settled for the D5 Connected. But then, the most important thing is to ascertain whether the D7 is worth the extra few hundred bucks or you’d instead go with the $500 D5 Connected. This is the central question we are going to answer in this Neato D5 Connected vs. D7 Connected comparison review. To start, let’s look at the two models in short before going to their similarities and differences. This was the top of the range Botvac model before it was outshone by the new D7 Connected. The D5 came as a surprise package for the Roomba 890 as it had almost all the features the latter had. The price is also within the Roomba 890’s range. Though the 890 is from a much popular brand, the D5 Connected has better features and value for money. I like the D5 Connected because its battery lasts longer; 30 minutes more than the D3 Connected and also, the Roomba 890. It will also resume cleaning after recharge, a feature only the Roomba 960 and 980 have. The D-shape design with CornerClever technology is also a noteworthy feature and so it the larger combo brush. Regarding cleaning performance, you can rely on the D5 Connected on all floor types, thin carpet, pet hair, and allergens. While the D5 Connected rivaled Roomba 890, the D7 Connected squares out with the Roomba 980. I know Roomba 980 is a powerhouse but the D7 Connected is also a force to reckon. 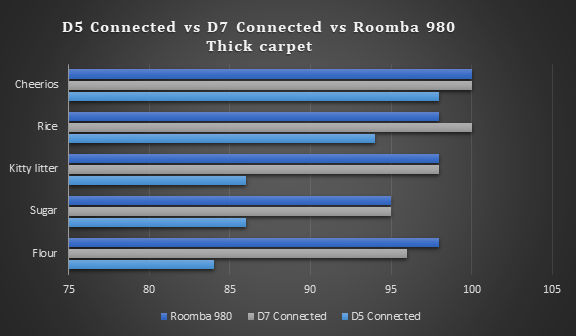 You can read the Roomba 980 vs. D7 Connected comparison review to see who the winner is. What I like about the D7 Connected is a couple of new additions that make it superior to the D5 Connected. It has a unique spiral brush, and combo brush, longer runtime, and the new No Go Lines feature among other additions. But then, most of the basic features are intact including the navigation systems, cleaning features and Smart features as well. But then, the price is very different; the D7 retails at $800 while the D5 has a $500 price tag. That said, you want to be sure you are paying extra for some worthy features. This is the main business today, and in this section, we want to put the two Botvac Connected models head-on. We will be comparing the two Botvac Connected models both regarding features and cleaning performance. Remember, they are from the same brand and Series so definitely, there are a lot of similarities. But then, the price difference assures you of some significant difference and features; that will be our core business in this section. 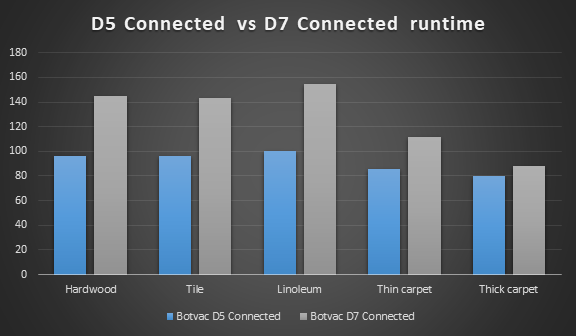 Without further ado, here is how the Botvac D5 Connected compares to the D7 Connected. The first thing you want to know about is the design of the two vacuum cleaners. You want a vacuum that will go under furniture and fit between tight spaces. So, how does the D5 Connected and D7 Connected as far as design is concerned? The D5 and D7 have very similar design and both feature Neato’s exclusive D-shape design with Corner Clever technology. This is an industry’s leading robot vacuum shape that works in a better fashion than round vacuum cleaners. This is because it fits tight corners pretty well and thus can collect the dirt that hides in these corners. This is unlike Roombas and other round vacuums. The other thing you want to consider is the height of the vacuum cleaner and the dimensions in general. Both the D7 and D5 Connected sport a 3.9-inch height which will allow them to creep under fur nature. 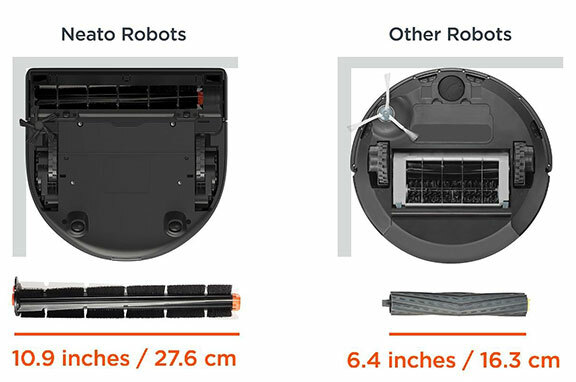 But I wish Neato would have made the design much shorter because 3.9 inches is very high – in fact, taller than Roomba which in itself needs a lot of improvement. So here, none of the two Botvac models is the winner, but for purposes of our comparison review, their score is a draw. Regarding overall dimensions, there is no winner again as the D5 connected, and D7 Connected measure and weigh almost the same. The D5 Connected measures 12.6×13.2×3.9 and weigh around 7.5 lbs. On the other hand, the D7 Connected is a bit smaller, measuring 12.5×13.2×3.9 and weighing slightly higher, 7.7lbs. So, what about aesthetics? Can you differentiate the D5 Connected form D7 Connected visually? The D7 retains much of the features on the top interface including the START button and light indicators. What brings the difference is the finish. The D65 Connected has a dark grey finish all over. The D7 Connected on the other hand has a dark grey finish with a silver accent in the middle section of the interface. Otherwise, all the other features are the same. The D5 Connected and D7 Connected are both great vacuum cleaners as far as design goes. But making them shorter should have been Neato’s priority. Both are very tall so that makes none of them a winner so you will want to dig deeper and find something more meaningful to base your choice on. This is the fundamental consideration when buying robot vacuum cleaners. That said, you want to know what the best vacuum is as far as cleaning performance is concerned. Is it the D5 Connected or D7 Connected? As usual, we tested the two vacuum cleaners under different conditions, and we are glad to present our results in this segment. We tested the D5 and D7 on a hardwood floor, thin carpet and thick carpet. Some of the dirt we used include Cheerios, kitty litter, sugar, flour, and rice. Is the D5 Connected the right cleaner for hardwood or you should upgrade to the D7 Connected? In our tests, both the D5 Connected and D7 Connected put up an exemplary performance clearing all the dirt. But the D5 Connected had trouble sucking up tiny flour particles that stuck in the tiny slots on my hardwood floor. But this is understandable considering it is quite an old looking floor. However, on tile and linoleum, expect 100% cleaning; no dirt is left behind completely! We also tested it on a light pile carpet, made from nylon fiber and the results greatly varied here. Both vacuums cleared the cereal and rice, but flour, kitty litter, and sugar was a problem. The D5 Connected performs poorly cleaning 88% of the flour, and 92% of the sugar and kitty litter. On the other hand, the D7 Connected is much better and cleaned 100% of the cereal, 99% of the sugar and 98% of flour and kitty litter. Personally, I’ve held the opinion that Neato D7 has a dedicated mode for carpets and here are the results that back my assumption. 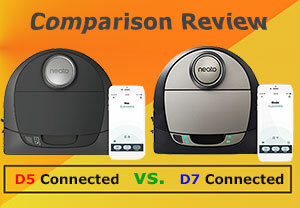 We have compared the D5 Connected and D7 Connected to the Roomba 980 that is known for its excellent performance on carpets courtesy of Carpet Boost. The D5 Connected performs poorly and is not a good purchase if you have carpets; whether thin or thick carpet. It managed to clean 84% of flour, 86% sugar and kitty litter, 94% rice and 98% Cheerios. As we have seen, the D5 Connected and D7 Connected offer different performance. The most important question to ask then is, what brings the difference? We are now going to carefully examine the features of these two vacuum cleaners to see what brings about the huge difference. But just before that, I want to mention something about cleaning priority. First, you will find that both models have been fronted for all-around cleaning. However, on carpets, the D7 passes the test as D5 Connected lacks the extra power. Otherwise, they will both suit all the other cleaning needs; from pet hair to allergens. Another thing, while both Neato vacuums share the same cleaning system; SpinFlow PowerClean, the features are different and that’s what we are about to look at. The motor is an integral part of the vacuum so it’s important to dissect the D5 Connected and D7 Connected to know which of them is the best. The first thing I liked about the D7 Connected is that it comes equipped with a new motor. It packs more power and efficiency. But the most striking of its abilities are the two modes it can run at; Eco and Turbo. In Eco mode, it is silent, and the motor operates normally. But then, when it comes to surfaces like carpets that require more power, Turbo mode is activated. As the name suggests, it delivers more suction power. This is why the D7 Connected has been likened to the Roomba 980 which of course has two similar modes but under different branding. Roomba’s Carpet Boost is just the same as Neato’s Turbo mode. The difference is that Roomba is much powerful than Neato, but all of them are ideal for carpets. This is among the reasons that put the D7 Connected on the map. As for the D5 Connected, it has only one mode and comes with a Gen 2 motor. Though it offers quite some good performance, it can’t handle carpet cleaning needs. But the D7 Connected is a real beast and shouldn’t be looked down on to. This is another area the two vacuum cleaners have disparities. The D5 Connected and D7 Connected both features a side brush but an entirely different primary brush. D5 Connected comes with a combo brush meaning it has rubber blades and stiff bristles. This is the same case for D7 Connected, but now the brush is spiral hence the name Spiral combo brush. The spiral combo brush is better as it reduces tangling, a common headache for pet owners. For those suffering from allergies, you want to know what Botvac will filter all the allergens. This is also a concern for pet owners as pet-related allergens are by far the leading cause of nasal allergies. Both D5 Connected and D7 Connected have Ultra performance filters. These are normally HEPA filters and will filter out 99.97% of allergens. So, what about the navigation system? Is it still LaserSmart or there have been improvements to rival Roombas revolutionary iAdapt 2.0 VSLAM navigation? What about floor scanning and boundary marking? Let’s find out if the D7 Connected is worth the $800 price tag. The D5 Connected runs on LaserSmart navigation. This is an advanced laser navigation system that works best from medium to high traffic rooms. But then, the D5 is not invincible, and from time to time, you will find the ‘I’m Stuck’ notification on your Smartphone App. Though I expected the D7 Connected to have a VSLAM navigation system, it still packs the LaserSmart SLAM navigation. This is one reason Roomba 980 is still the king as it has a VSLAM navigation for high precision navigation. But one advantage of Neato D7 Connected is that LaserSmart is not highly dependent on light like iAdapt 2.0. Back to our case, the D5 Connected vs. D7 Connected. I wouldn’t front any as the winner when it comes to the navigation system. But what about the cleaning pattern? Which one will clean the house faster? For some reason, the D7 Connected finished cleaning a two bedroomed hardwood floor apartment faster than the D5 Connected. Though they all use a systematic cleaning pattern, floor mapping and scanning in the D7 Connected is improved. You can see that even from the turns it make and the routes it chooses to follow. But the highlight of the D7 Connected is in boundary marking. It features an industry’s leading boundary marking technology that requires no devices; no physical markers like the D5 Connected or Virtual Walls and Lighthouses like Roombas. You draw the borders on the FloorPlanner right from your Smartphone. This is easier to use and much more precise. The only downside is that you require the Smartphone App to use it. You can’t use No Go Lines manually. But still, the physical boundaries of the D5 Connected are compatible with the D7 Connected. So, no Wi-Fi, you can always set limits. The D7 Connected is an excellent choice as far as navigation and maneuverability are concerned. However, in light of its competitors, Deebot R95, Roomba 960 and Roomba 980, you might want to question why it didn’t come with a VSLAM navigation. If you have a high traffic room, I’m afraid the D7 Connected is not value for money. You’d instead grab the Roomba 960; cheaper and features an accurate VSLAM navigation. But still, you can’t ignore No-Go Lines, the D7 Connected’s primary strength. It is effortless to use and requires no devices like the others. 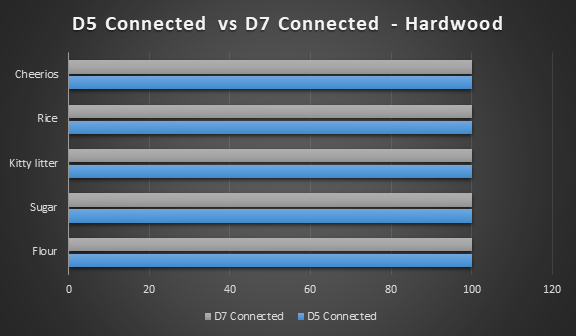 But compared to the D5 Connected, D7 Connected is the winner! You want to settle for a vacuum that has a powerful battery for longer runtime. You must also be considering the life cycle of the cell. So, how exactly does the new D7 Connected line up against the D5 Connected? The first thing you want to want to know is the type of battery technology used. I am glad Neato used Li-ion battery technology in both D5 Connected and D7 Connected. You may want to ask, what’s the advantage of Li-ion over NiMH batteries? Li-ion battery technology is the latest and is a favorite because it has a longer life cycle. Initially, NiMH was popular because it could hold more charge. However, the life cycle is what’s most important. When it comes to running time, how do they compare? This is perhaps the most important consideration when assessing battery and power management. The D5 Connected runs for approximately 90 minutes, higher than the Roomba 890. On the other hand, the D7 Connected will do an average of 150 minutes when in Eco mode and 100 minutes when in Turbo mode. Here, the D7 Connected is the winner, of course, it works twice as long as the D5 Connected. One thing I want you to note is that these two vacuums will offer varying runtime depending on the surface it is cleaning and consequently, the cleaning mode. We did comprehensive tests on all surfaces and even though the exercise was very tedious, here are the findings. As you can see, the surface that is being cleaned determines the runtime. On smooth surfaces, the vacuum cleaner moves with a buzz as less torque is required. On rough terrain, more power is needed and consequently, a shorter runtime. Besides, other factors will give your Neato a shorter runtime. For example, a full bin will have a short runtime because of the weight. Another thing, the cells become weak after frequent charging so the aging cells will have reduced capacity. Lastly, we look at recharge and resume function. First off, the D5 Connected will take around two hours to recharge while D7 Connected will take approximately two and a half hours. When it comes to power management, both vacuums will recharge and resume cleaning. This is a pretty impressive function that expensive robots like Roomba 890 don’t have. But Neato has equipped most of their models with this feature including the cheaper D3 Connected. This covers for the short runtime because cleaning will be completed. This is unlike in other vacuums that will require prompting after recharge. Today, robot vacuums are intelligent as they connect with other devices. But then, the D7 Connected has the upper hand as it comes with several additions. Here is how the tow Neato robot vacuums compare. You want a robot that you can program and both the D5 Connected and D7 Connected offer just that. Like all robot vacuums, you can schedule daily cleaning for the entire week. Please note that you can schedule a cleaning time once daily. So, if you require additional cleaning, you have to use the manual START button or Smartphone App. But I’m sure this is among the hitches that Neato could solve in the updates promised. So, what about Smart connectivity? Neato D5 Connected and D7 Connected come with Wi-Fi. This was expected considering even the D3 has Wi-Fi. However, there’s something unique in the D7. It is compatible with the 2.4GHz band as well as 5GHz. 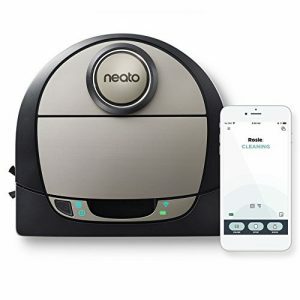 So, if you have 5 GHz Wi-Fi, Neato D7 Connected will be the best robot vacuum. Better than the likes of Roomba 980 and ECOVACS Deebot that rely on 2.4 GHz. When it comes to Smartphone App features, D7 Connected has the edge over D5 Connected. It offers a feature similar to the Roomba 980’s Clean Map reports. This one is called Coverage Maps and shows you where the vacuum cleaner reached. When it comes to Smart features and convenience, the D7 is the winner because of the extras and most importantly, the additional 5 GHz Wi-Fi compatibility that even Roomba doesn’t have. Regarding costs, the D5 Connected has been retailing at around $500 of late and this seems to be the recommended price. But you can find it on offer for $450 or lesser. On the other hand, the D7 Connected retails at $800 and since its introduction, we have rarely seen it drop the price. We don’t see it dropping the price either not until some other brand steals the show. For many customers, deciding between going for the D5 Connected at $500 or the D7 Connected at $300 more is a big dilemma. Now, everyone wants value for money and here are a few thoughts regarding value for money. When it comes to value for money, the debate is very controversial. There seems to be no agreement on what cleaner gives you value for money. Personally, I’m also torn in between the two. Here are my afterthoughts regarding value for money. Both the D5 Connected and D7 Connected offer value for money as long as you are making use of all the features. The D5 Connected is a great deal in particular compared to Roomba 890. The former has auto resume function and a better navigation system and costs almost in the same range. If you don’t have a carpet and you don’t mind using physical boundaries, the D5 Connected is your match. At least you can save enough to get a robot mop. When it comes to the D7 Connected, the question is, is the longer battery life and No Go Lines worth the extra $300. If you have a carpet, the answer is definitely yes, and so it is if you have large floors to clean. As for No Go Lines and Coverage Maps, I don’t think it is worth to pay the extra $300 for them. 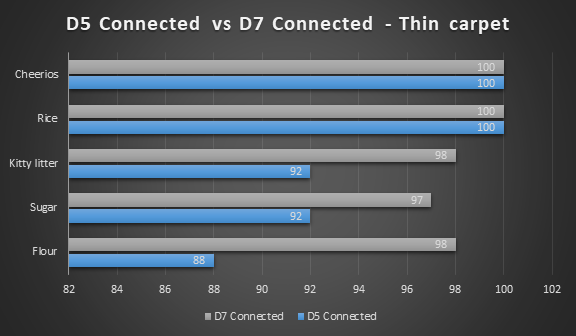 Now, we are almost coming to the end of the D5 Connected vs. D7 Connected comparison review. I know it may still be a problem to decide whether to go for the D5 Connected or D7 Connected. For us too, it may be difficult to determine the best vacuum for you. We don’t understand your budget and most importantly, your cleaning needs. However, one thing is for sure, one of these vacuum cleaners fits your needs so which one? When it comes to features, the D7 Connected is the ultimate winner; there’s no doubt about that. The problem is the extra $300 since the same brand is also giving you a cheaper option. Personally, I like the D7 Connected and here are reasons why I think you should buy the D7 Connected. In the same token, the D5 Connected is still a worth robot vacuum cleaner. 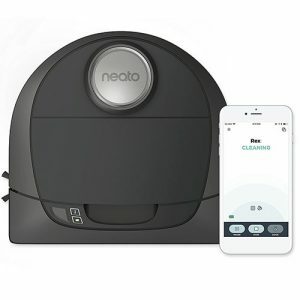 If you are on a tight budget, it can be a good robot vacuum to consider. Here are reasons why I would still consider buying the D5 Connected if I am on a tight budget. Finally, we have come to the end, and there you have a complete Botvac D5 Connected vs. D7 Connected comparison review. Carefully assess your needs and buy a cleaner that fits your cleaning needs. But if I was to influence your decision, the D7 Connected is the best choice. In as much as it is expensive, the excellent performance justifies the price!